Diageo Reserve’s luxury blended Scotch whisky, Johnnie Walker Blue Label has unveiled an exclusive partnership with The Whisky Shop, Piccadilly. We headed over there last night to see what it was all about. If you visit The Whisky Shop on Piccadilly, right opposite the Ritz, you’ll see for yourself the Johnnie Walker-branded shop front featuring LED screens showing the newly launched Gentleman’s Wager II film, featuring Jude Law and Giancarlo Giannini (Mathis in the first two Daniel Craig Bond movies). Check out the short film above – it’s as stylish as the stars. There are also a number of ‘takeover’ walls and stands throughout the store showcasing the luxury whisky brand. And if you’re in need of an idea for a Christmas present for that person hard to buy for, but who loves the finer things in life, then you should check out the brand’s new 20cl limited-edition gift box, which the UK has the lion’s share of, which will also be available to purchase in store. The Whisky Shop also stocks the highly sought-after City Edition bottles, celebrating the London and Edinburgh skylines. The UK’s favourite luxury Scotch whisky supports the wider ‘Joy Will Take You Further’ global campaign, with a focus on the joy of giving, positioning Johnnie Walker Blue Label at the forefront of super premium gifting in the run up to Christmas. 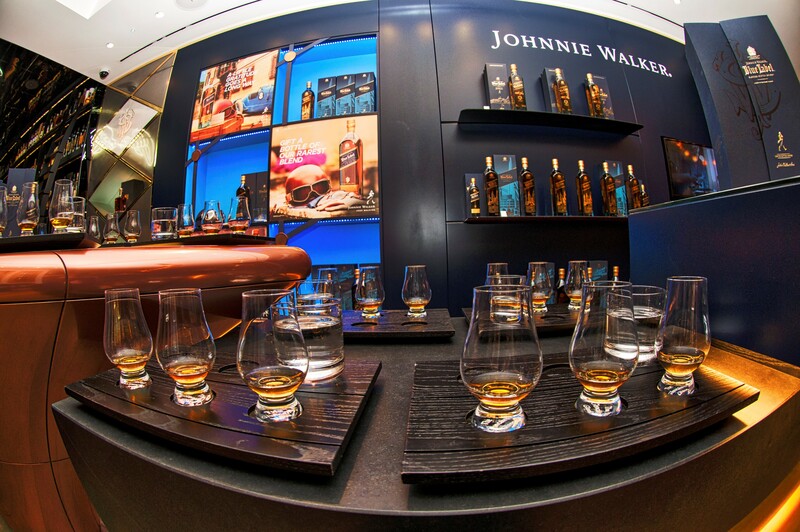 If you’re still not convinced, you can have the Johnnie Walker Blue Label experience yourself at The Whisky Shop throughout December. Tasting sessions led by The Whisky Shop’s team of specialist whisky staff will be held on 4th, 10th and 17th December between 5-7pm. It’s free and there’s no need to book. We’d highly recommend it, having experienced for ourselves a tasting session in the store. The intimate sessions are designed to introduce whisky fans and those new to the category alike to Johnnie Walker Blue Label, the ultimate gift for Christmas. The brand’s new 20cl limited- edition gift box will be available to purchase. Johnnie Walker Blue Label has also partnered with Quaglino’s, a contemporary European restaurant and bar located in the heart of London’s Mayfair. The award-winning bar team has developed an exclusive celebratory cocktail, the Blue Note. The elegant serve is made using a hand crafted ice ball, 50mls Johnnie Walker Blue Label, 25ml Lillet Blanc, 15ml Mandarin Napoleon and drops of Grapefruit Bitters. If you head over to The Whisky Shop for a tasting session and want to Tweet, the handle is @JohnnieWalker_ and the hashtag #JoyofGiving.